Highland cows are a Scottish cattle breed. They have long horns and long wavy coats. They originated in the Highlands and Western Isles of Scotland and were first mentioned in the 6th century AD. 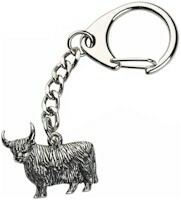 A Highland Cow made in pewter and supplied on quality key chain.